Victory Day is coming and the capital is scrambling to prepare for Saturday’s celebration of the 70th anniversary of the Allied defeat of Nazi Germany. The day will be bursting with activity, from a massive military parade replete with shiny new tanks and military vehicles of yore in the morning, to a spectacular fireworks display in the evening. According to police estimates, some 2.5 million spectators are expected to observe and participate in the hundreds of events set to occur across the city. To help our readers navigate the festivities, The Moscow Times has compiled a list of the day’s highlights. Activity hubs: Though the city as a whole is expected to be bustling with activity on Victory Day, five locations will serve as the central activity hubs beyond Red Square. These sites will feature concerts, films and other festivities: Poklonnaya Gora, Patriarch’s Ponds, Pushkinskaya Ploshchad, Tverskaya Ploshchad and Teatralnaya Ploshchad. 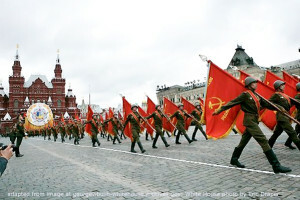 The Parade: Victory Day will kick off in Moscow with its pièce de résistance – a parade featuring some 200 military vehicles along with 150 aircraft, which will begin at 10:00 a.m. on Red Square. More than 14,000 soldiers are set to participate in the event, which will also be broadcast on television, and projected on screens throughout the city, including at all five of the aforementioned activity hubs. Immortal Regiment March: At 3:00 p.m., thousands will march down Tverskaya, the capital’s central thoroughfare, to honor the memory of those who died in combat. Many will carry portraits of their loved ones who fought in the war. War Cuisine and Karaoke: Moscow’s main pedestrian areas, such as Kuznetsky Most and Old Arbat, will host an array of interactive events. Muscovites will have the opportunity to taste military cuisine, sing World War II-era songs at makeshift karaoke platforms and watch musical theater shows. Memorial Tours: A variety of tours featuring World War II sites will be available free of charge between May 8-10. On these days, the “World Remembers” program plans to run 150 walking tours and 12 bus tours around the city. All wishing to sign up will be required to register on the website mosartagency.com. Moment of Silence: A city-wide moment of silence will be observed at 6:55 p.m.
Fireworks: The 70th anniversary celebrations will culminate in a grand fireworks show that will illuminate the night sky at 10 p.m. This year, light projectors will be used to lend a dramatic air to the standard display. Fireworks will be set alight from 16 different locations around the city. Anyone hoping to maximize their experience will do well to watch from the Vorobyovy Gory observation deck in southwest Moscow, or from the Poklonnaya Hill platform in the western part of the city. But go early, as both spots – known to be prime viewing locations – will fill up fast.